The nominating committee is pleased to present the slate of officers for 2017-2018. We appreciate everyone’s willingness to give oftheir time and efforts. We will elect our new board on Tuesday, November 15, 2016. We encourage SANG members to view the exhibit “Embroidering the Old Spanish Trail”. Artist Laura Gibson created hand-embroidered and drawn works on 1920s player-piano rolls that recreated the storied roadway. The exhibit is open through December 17, 2016, at Bihl Haus Arts, 2803 Fredericksburg Road, SAT 78201 across from Tip Top Café. The Gallery is open Friday and Saturday from 1-4. Phone 210-383-9723. You can find more information on the website: bihlhausarts.org. Please bring any winter, holiday or Christmas themed items to any stitch in or meeting before November 12. We will have a display at Forest Hills Library. They have a lovely locked display case. Please be sure to have your initials or name on the piece to ensure it gets returned to you. We are going to set up the display on Saturday, November 12 at 2:00 pm after our technique class for the Christmas tree. Bring your piece to the class or a stitch in or contact me at 210- 422-4770 and I will arrange to meet you. Membership the most important part of SANG. We offer our members monthly programs and technique classes, special events such as the ever-popular retreat and field trips such as this year’s trip to Fredericksburg to see the Sampler Exhibit, as well as access to publications starting with the SANG Newsletter, the NeedleArts magazine and automatic membership to EGA with all its resources. We also draw on our membership to give us suggestions and profit from their time and knowledge. Stitch-ins and stitching in public shows off our members’ talents and highlights their creativity. You don’t have to be an accomplished stitcher to join, though! We welcome all levels of expertise, from beginners to experienced stitchers and anything in between. so far for this year and welcome all our new members. We have a total of 76 members, 15 of which are new to SANG. If you have not yet renewed your membership, it is not too late. New members are always welcome and enjoy prorated dues depending on when membership is requested. We invite SANG Stitchers to change the world …one child at a time. 2) Flowers and/or insects, inspirational words or phrases, and princess stuff for girls. Outside Dimensions: 13×13 inches, PLEASE make sure it isn’t less than 12×12 inches. If your fabric is 12×18 in. please cut the 18 to 13 inches, which is fine. Inside Dimensions: between 9×9 inches and 5×5 inches for design. If your pattern ends up being 3×3 inches or less (design area), please put a border around it. Patterns cannot exceed 9×9 inches. Please bring your finished squares to our November program. Cindy was first introduced to beadwork in 2004, when she made and embellished cloth dolls. Beading became herpassion; and after gaining experience in many different techniques, she began teaching beginner classes ASG. Her background in computer programming and mathematics was excellent training for developing very detailed instructions for her patterns. 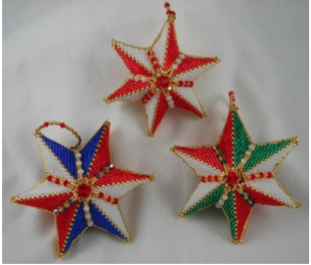 She particularly enjoys creating three-dimensional pieces such as this star ornament. Cindy has taught at both SCR Regional and EGA National Seminars. This is an important meeting, as we will elect the officers for 2017- 2018, so please attend. It is also our annual Outreach Meeting and this year we will be turning in our quilt blocks for Love Quilts USA. SCR has expressed interest in this project — so plan on having pictures taken with your turned-in blocks. Thanks to all who have wholeheartedly participated in our outreach program. Please bring any of the Technique Class projects or other project (your SAL, Christmas gifts…) to work on during the meeting. It is hard to believe that it is November. It was nice to see all of the projects that everyone brought to Show and Tell in September. That got me thinking. I know that is a dangerous concept. I am still recovering from the closet disaster of August 2016. Not all of my stitching stash has made it back into my closet because I am taking the opportunity to put some organization into my works in progress (WIP). I have noticed that as I have been going through my WIPs that if I dedicated a weekend to some of these projects I could get some of them done and out of my closet. I watch a lot of floss tube (Individuals on You Tube that talk about their cross stitch) and several of them belong to a Facebook group that is doing a year of WIPs that is going from October 1, 2016 to December 31, 2017. If I were on Facebook I might consider joining this group to do this challenge but since I am not I think that I will take the idea and modify it fit my stitching journey. I want to thank Diane Williams for all of her hard work setting up our retreat this year. This year the retreat was held at the Inn of the Hills in Kerrville, September 28 – October 2. Because of Thanksgiving, we will be moving our fourth Tuesday meeting to the third Tuesday, November 15, 2016. The November 12, 2016 technique class is Elegant Holiday Tree. The deadline to join this event has passed. Please bring your finished quilt blocks that you have stitched for Quilts of Love to our November meeting for turn-in. Our December Luncheon will be Saturday December 10 at La Fonda Alamo Heights. The cost is $18. December 5th is the deadline to sign up for this event. More details will be in the newsletter and you can send your check to Diane Williams. We will be doing winter themed display for the Forrest Hills Library running from the end of November to mid January. If you have any pieces that fit in that category that you would be willing to lend the Guild contact Joan Vanderbrink. Please make sure that you name is somewhere on your piece so we know who to give the piece back to when we take down the display. I would like to encourage all of our members to make an effort to attend our November meeting so that we can vote and approve the budget for next year before our outreach program. I know it is difficult to remember because of the meeting falls in the 3rd week of the month. So mark your calendars and plan to attend.